Airports today are a collection of immense infrastructure with a vast array of systems and products that must work and interact in order to keep the airport operating efficiently 24/7 all year around. One Airport – One Process is the concept of viewing the airport as a whole; as one operational entity with many parts who are all tied together by the aircraft movements, from arrival to departure. 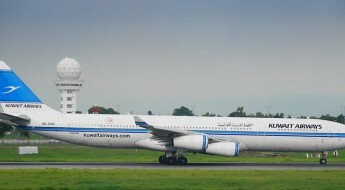 By looking at the one operational process which interacts with all parts of your airport, they need to be fully efficient as an individual and work together to achieve optimal efficiency as a whole.To meet the One Airport – One Process framework, synergies that achieve common performance based objectives must be reached between the organisational structures, the procurement and ownership of systems services, and products. Examples of already existing systems that can be utilized to improve operational performance include the airfield lighting ILCMS (Individual Light Control & Monitoring System) and the A-VDGS (Advanced-Visual Docking Guidance System) at the gate. Both of which have great potential for being utilized for a higher level in the total operational concept at the airport. These systems are very common at airports worldwide and are available for integration with other operational systems. 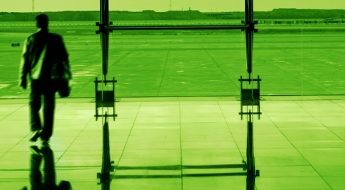 With the results from the recent SEAC Follow the Greens validation trial performed at Frankfurt Airport, we know that savings in taxiing times are considerable when airfield lighting is used to support navigation on the airfield. At many airports, simply operating pre-defined routes would generate significant savings compared to the non-standardized route assignment utilized today. Additionally, it is not unusual that radio frequency is a limiting factor in the apron area, during low-visibility and where other weather phenomena are present such as snow and freezing conditions where de-icing is required. Airfield lighting is a mandatory system for all airports as part of their compliance to the requirements for Category I operations or higher. In addition to the traditional airfield lighting solutions, there are great benefits in incorporating ILCMS, as it would provide the ability to control and monitor each and every light and segment on the airfield. Traditionally ILCMS has shown most benefits from a monitoring point of view, where it makes the maintenance significantly easier because the lights do not need to be manually inspected as frequently. This can be done from a fairly standalone system point of view, where the maintenance department can see the real time status of the airfield on a screen. When expanding the use of airfield lighting ILCMS to integrate into operational systems such as Electronic Flight Strips (E-Strip) and A-SMGCS (Advanced Surface Movement Guidance System), the airport can improve the use of individual systems as part of an airport wide operational concept. This integration can provide an active guidance tool for the pilot to follow, reducing (or eliminating) routing compliance errors and improving taxi efficiency. Integration also allows this to be achieved in a manner that reduces ATC workload, and moreover is integrated into their existing workflows. This has shown great savings in terms of taxi time and fluency that is directly reflected in fuel burn, taxiway predictability and safety. A correct integration of the E-Strip function will help connect ATCO decision processes to the airfield lighting for efficient management of stop bars and taxiway centreline lightings. It will actively reduce the workload for the controller and at the same time ensure stop bars are being utilized more effectively, increasing runway safety. A-VDGS is traditionally a system that actively provides guidance for flight crews and personnel on the ground in order to park the aircraft at the stand in the most efficient and safe manner possible. During the turnaround process the display capabilities of the system are typically not used. However, airports are beginning to integrate the A-VGDS so it can be utilized for other functions, including as a message board (also known as RIDS, Ramp Information Display System) for milestone communication to flight crew and ground personnel within the A-CDM workflow. Another way to utilise the A-VGDS is as a data collection point. The strategic position of the A-VDGS (i.e. in difficulty areas close to the terminal building) can be utilised to track the progress of the turnaround process. A-VDGS input to systems such as DMAN (Departure Management System) and E-Strip can be used in order to improve pre-departure sequencing and progress awareness for the ATCO and additional stakeholders, who may benefit from this information. These information sharing systems can improve on-time performance for departure flights and a reduce radio communication, which in turn reduces ATCO workload and enables better, more efficient practices. There are many advantages to opening up and sharing the operational value and benefits that already exist within the different silos at the airport. By simply looking at existing infrastructure and systems from another perspective, the potential operational performance may be revised and much needed Airport Traffic Expansion (ATX)can be achieved to support future traffic increases. 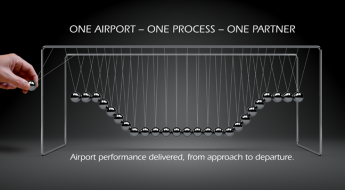 “One Airport – One Process. ATCO Predictability & Awareness Improved By Active & Visual Flight Crew Guidance“ was originally published in Airport Technology´s latest Special Report; “Next Generation Integrated Solutions for Improving Modern Airport Operations”. The report is the only report being produced for Airport Operators in 2015 that is 100% focused on integrated solutions for improving airport operations and aims to provide the readers with the facts, figures, data, analysis and opinions needed to make informed decisions.